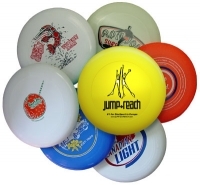 Ultimate Disc with varying designs of different teams, events, etc. 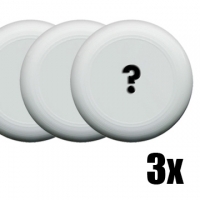 Misprinted discs are available at discount prices because the printings have some imperfections. The discs themselves are perfectly manufactured and all fly perfectly fine. The best choice if you care about the disc and the price but don't care about the print. Many of these discs are unique ;-). Most discs are white, though there also might be other colours (yellwo, orange, blue, black, ..) or even special colours like phosphor or UV at no upcharge. There is no choice of colours. This Product was added to our catalogue on Tuesday, 07. December 2010.